If you have read my updates previously (in particular the one for Autumn (Half Term) 2014), then you will know that, soon afterwards, I was due to undertake my fifth international cycle challenge to raise money for Norwood (a charity for children and young people with disabilities) using a specially modified recumbent trike. I am pleased to now tell you that I completed the ride successfully during November 2014. Then, to my surprise but delight, the night after I returned, I was given a ‘Points of Light’ award personally by the Prime Minister, David Cameron, at a fundraising dinner. This was in recognition of my ‘Outstanding Volunteering’, by having now raised £125,000 for charity these past few years. More impressive to my children though was the fact that Simon Cowell was in the audience and also came over to congratulate me! 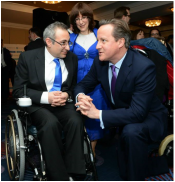 If you are interested, you can watch a short video of what David Cameron said about me here. It is not often that you get ‘bigged up’ by the Prime Minster!